British boxing sensation Amir Khan has announced that he will be getting engaged to Pakistani-American Faryal Makhdoom on January 29, The Sun reported Monday. 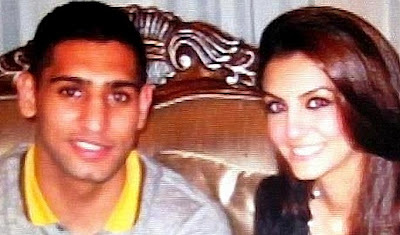 Aamir Khan is 24years old and Faryal Makhdoom is 20 years old. Almost 1000 Guests has been invited to the engagement with over £150,000 to be spent on the engagement party. According to Aamir Khan he will continue with boxing even after he gets married. He said: "Getting married won't change me. I will still be the same way. Faryal knew what I did for a living when we met. My sport will always be important to me. The family are good in that kind of situation because they take the pressure off me. "Fighting must still come first while I am trying to achieve my aim of becoming the best pound-for-pound fighter in the world. "She understands that. My fiancee knows my sport will come first because it is what I do." The engagement is supposed to be held on 29th January we will try grabbing engagement pictures.